With cufflinks.com accessories, you can flaunt your love for Marvel comics while adding a bit of color to the office suit and tie. These conversation starters change the water cooler chats from weather to "Which superhero would you be?" in a heartbeat. While sporting an Avengers tie, deadlines turn into child's play. Cufflinks accessories make for the perfect gifts, either for yourself or for that professional in the family who just landed that big job. From ties to money clips, these Marvel-themed accessories are sure to brighten up an 8am meeting and start any presentation off on the right foot. Whether you’re the boss who sometimes has a Hulk streak, a salesman looking to make that heroic sale, or just someone who wants to channel a little more power without slamming down coffee, these accessories are for you. And, with Infinity War premiering in just a few weeks, you can start your collection now to celebrate the unprecedented crossover. Not ready to wear your cape over your clothes? No worries — Cufflinks has the socks to make you feel like a warrior with every step. 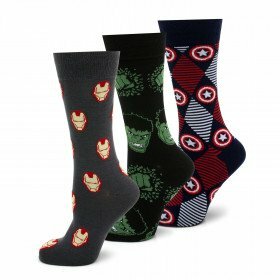 Whatever design and superhero you're looking for, Cufflinks has the socks to match. Looking for that subtle hint that you can’t wait for Infinity War? Cufflinks offers both 2D and 3D cufflinks to keep your suit looking sharp for any presentation. 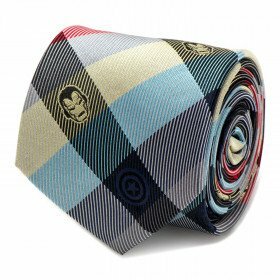 To give your outfit that Marvel pop, a Black Panther tie will easily do the trick. With Cufflinks accessories, you can get the true superhero look without the flashiness of a mask and tights. Need to convince your teen to dress up for a school event? Marvel Comics cufflinks, ties, socks, and other accessories are simply the perfect match for a young professional’s first suit. 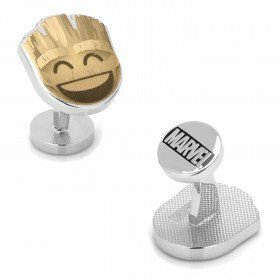 A Groot cufflink will make the transition that much easier for everyone involved. Before you know it, they’ll be wanting to get another suit to match their Avengers’ tie and Iron Man tie bar. A Marvel fan doesn’t just exist outside of office hours. When the Marvel universe is piecing together in just a few short weeks, you can’t just hide your inner Captain America. And with Cufflinks.com, it’s now possible to share style and fandom. From the small glow of a cufflink to a tie bringing the entire outfit together, you can create a look that both reflects your professionalism and creativity.